What is it about having guests over to your house that makes you feel the need for everything to be squeaky clean? Do real people actually live like that? 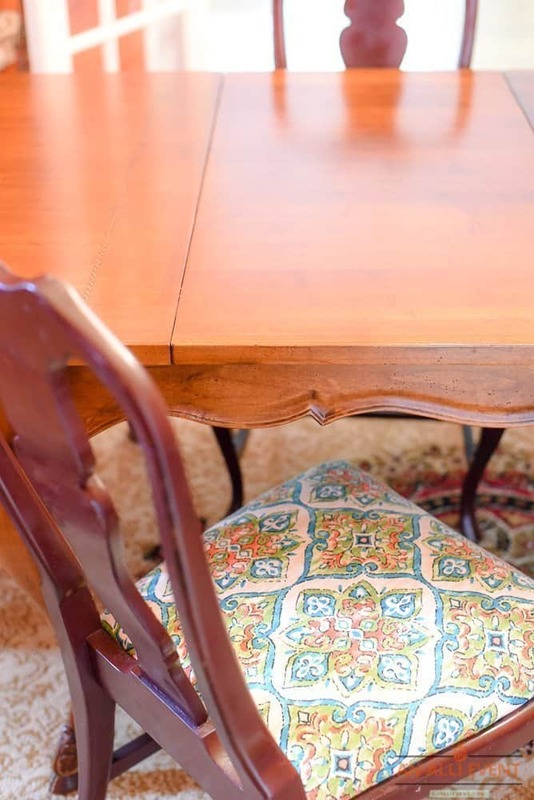 Thankfully, it’s easy to do this Dining Room Chairs Refresh. It didn’t take long at all to complete. I have a husband and four boys, so although I would love for our house to look like a magazine every day, it just doesn’t. Most days I have to fuss at them for not leaving their shoes at the door, leaving a toy in the living room or (my favorite) leaving the toilet seat up. l love having company over and entertaining, but am I the only one who becomes momzilla when preparing for guests? I want everything clean and spotless and I want it done yesterday NOW. Recently, I decided to have my entire family over for Sunday lunch. This sounded like a good idea until I noticed that my dining room chairs needed some TLC. I purchased my dining room table and my chairs from two different sellers off of Craigslist. The table was practically brand new and was located a short drive from my house. The dining room chairs were a different story. It was one of those cases where the pictures online looked a lot better than real life. The seller was asking $150 for six Queen Anne style chairs but was located an hour and a half from my house. It was such a good deal that I didn’t mind the drive. When I arrived the chairs were scratched up and half of the seat cushions were ripped to shreds. The seller had failed to mention that he had an inside cat that had really done some damage. What to do? I love a good project so I bought the chairs, knowing I could fix them by using a furniture touch up kit and recovering the cushions. The furniture touch-up kit worked its magic. It really does cover most of the scratches on the chairs. I planned on recovering the seats the next week, but then soccer, basketball and baseball season got in the way. So, four years later, here I am ready to recover the cushions. Joann Fabric & Craft Store is my favorite place to buy fabric, so I picked up my favorite shopping buddy (aka Mom) and headed there. The outdoor fabric was the best choice to recover my chairs because it’s the easiest to clean. My mom and I have similar taste when it comes to design so she spotted the perfect fabric right away. I loved the fabric, the purchase was made, and we were out of there in 10 minutes. Recovering chairs is a simple project that can be done in four easy steps. It only requires your chair cushions, new fabric, a screwdriver, and a staple gun. Unscrew the cushions from the bottom of the chairs. Unroll the fabric, measure the cushion and cut off a little more fabric than what you need to allow room for stapling. Lay the cushion on the fabric so that the bottom side is facing upwards. Pull the fabric tight and staple it to the wood on the bottom side. We did the sides first and then worked the corners. My husband is such a sweet man and my partner in crime for all of my DIY projects, so he jumped in and helped. My baby boy also wanted to use the staple gun, but we compromised with him using the screwdriver instead. I absolutely love the transformation! 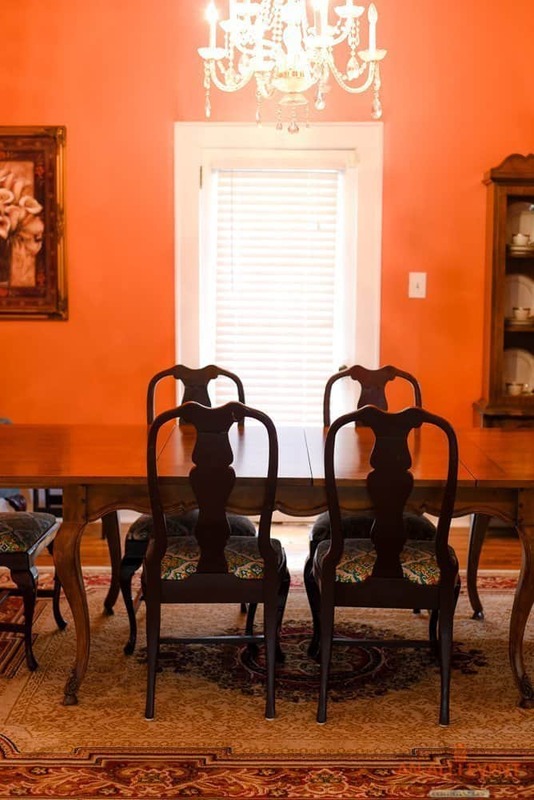 This fabric made the chairs look so much better and brought the dining room to life. I received many compliments from my dinner guests. The new look of the chairs turned out really great. Love the material you choose. Second hand should never be over looked and reused. I love that fabric! I have remade my dining room chairs, too. Don’t look at the bottoms, though, that area is a hot mess. Oh gosh, I so need to do this with our chairs. They are stained and pretty gross looking. I need to see if I can do this on my own. I’m pretty awful with handy stuff like this. I love how your chairs turned out. I love how this looks! I do need to recover a couple of my chairs right now and I love the idea of doing it like this. You have a great idea and I going to do it too! Love the transformation of this space and the fabric choice. So pretty! It’s amazing what a little fabric and imagination could do. Those look so much better! We’ve done that to our dining room chairs too. The end result was fabulous. LOVE!!!!! LOVE this idea. I don’t have chairs like that to re-“wrap” if you will, but I soooo would if I did – you could change em out every few years too! What a great idea! I would love to do this with my chairs, they could use a little refresh! So pretty too. 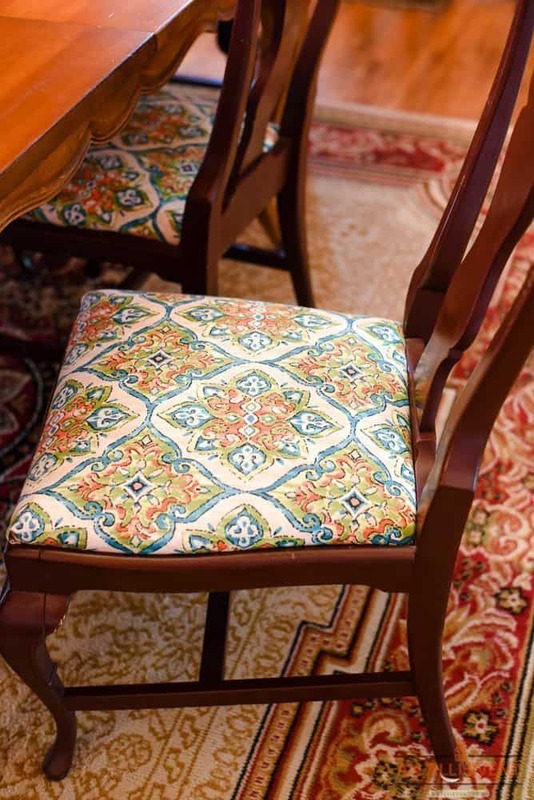 This is a great way to update dining room chairs without buying a whole new set. This is great. Oh they look so much better! I love your fabric choice too! I have a bench seat, made with leather, I am now curious if I can re-upholster it myself! Hmmm!!! those look amazing!! i’ve re-covered my dining room chairs twice. it makes such a difference! Definitely looking better and seems like it is a brand new chair after the make-over. So beautiful. Love it and maybe I can try this at our home too. That turned out beautifully! My parents owned an antique store when I was growing up, so seeing old items get a new life always makes me smile. OMG! You had a great idea! I need a furniture touch up kit, too! And recovering the cushions seems to be so easy! These really look great! 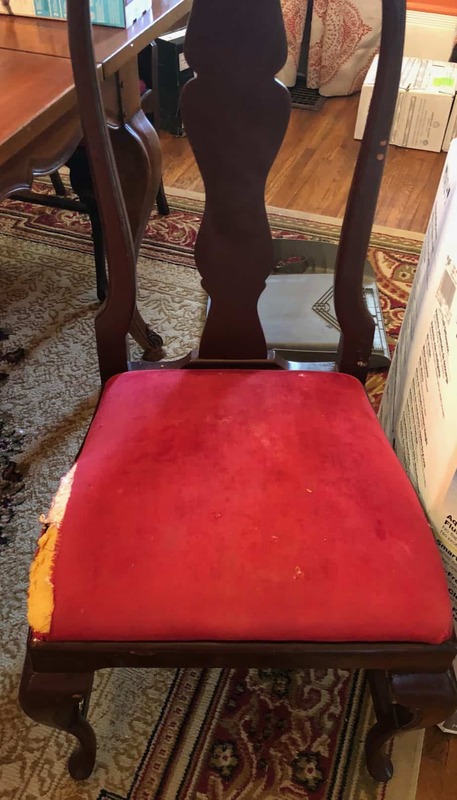 It is amazing what a little elbow grease can do to an old chair! 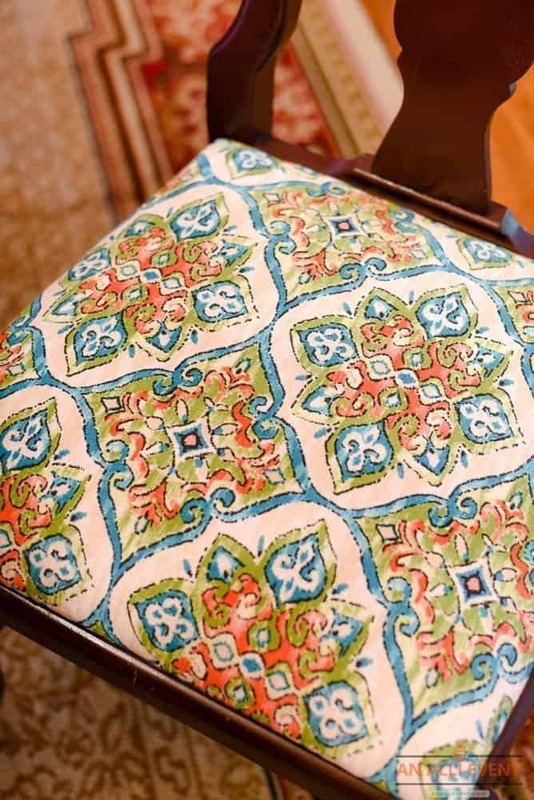 I love that beautiful material and pattern on your new “refreshed” chairs! What a wonderful DIY project. I’m the least crafty person ever, and these look totally doable. Even for me! Such a cute update! Such a simple trick can make a huge difference. Love the pattern too. Thank you for sharing, and I am inspired to do this also.